Lewis University senior, Stefano Sparano, has been selected as the tenth recipient of the Lockport Woman’s Club/Pat Darin Internship. 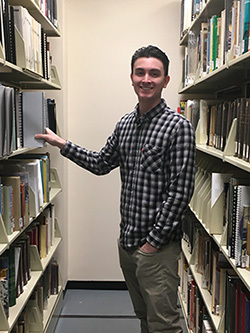 Sparano is a history major and business administration minor from New Lenox, Ill.
Sparano will work on the accession of accession financial records, annual reports, and news releases recently donated to the Adelmann Regional History Collection by the Lockport Woman’s Club. He also will complete a research project highlighting the history of the internship and other interns before him. “I am very grateful to the Lockport Woman’s Club for giving me the opportunity to get first-hand experience working in local history. Working at the History Center will help me improve my organizational and research skills. Internships are so valuable as they provide real-world experience,” said Sparano. The Lewis University History degree program provides more than just names and dates. History is the entirety of human civilization - past, present and future. History degree students at Lewis University study historically significant events, ideas, persons and civilizations. They prepare to analyze modern-day economic, social and political happenings with deeper clarity and wisdom. Graduates of the program are game-changers with an intelligent interdisciplinary background in their belief and the research and communication skills necessary to make a difference.